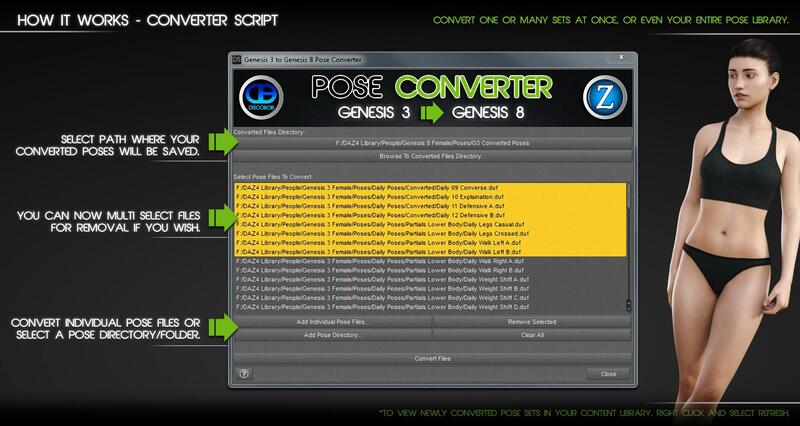 Is there a simple tutorial somewhere on how to use the Pose Converters? I already bought them all, but I'm not finding a straight, simple answer on how to actually USE them. As far as I know you select the folder or files you wish to convert (you actually select the PNG thumbnails, otherwise you wouldn't have any visual feedback on what you were selecting) and tell the script where to put the converted poses. I've never been able to get them to work. I used the same instructions you mention, but no converted poses will work. What poses are you trying to convert? I was trying to convert v4 poses to g2f, then g3f. Neither of the converted poses, G2f or G3f worked when I tried them.